Greetings Marshlanders! We are ecstatic to announce that we are returning! 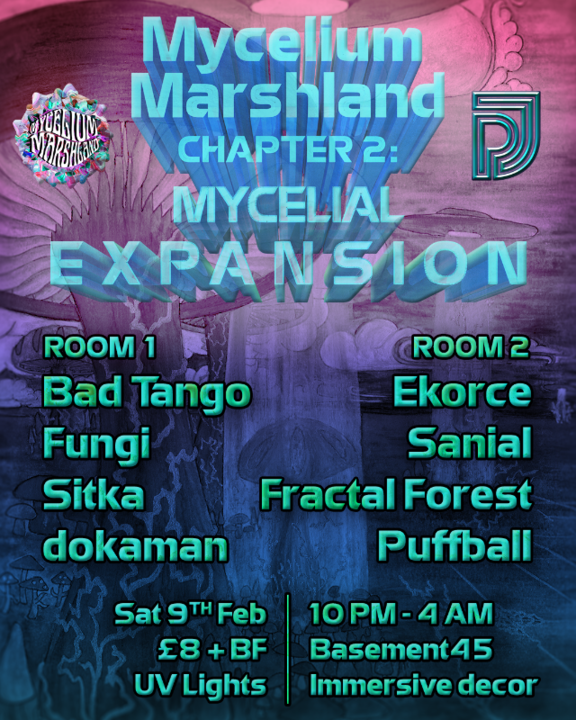 This time we are are migrating over to basement 45 for another night of psychedelic mayhem, this time spanning two rooms! Prepare to be transported into a world of immersive UV decor and mind blowing music! Inspired by psychedelic music for many years, Kyrian launched the project Ekorce in 2014. The name is derived from the french word “écorce” emphasising the organic and raw aspects of his music. In the last year he has released with both Audio Alchemy (Hedflux's label) and Merkaba Music! Label masterer for Psy Jelly and all round musical wizard Sanial will be bringing his unique style of psychedelic glitch to keep you moving your feet! Co-founder of Psychedelic Jelly Fractal Forest will once again be gracing the decks to bring you plenty unreleased and forthcoming material! Local producer Puffball's heavy dub and psychedelic influences result in delicious squelchy beats that you can't help but bounce to!